Home » Magazine » National » CBI-Kolkata Police Face-Off: Can Mamata Establish Herself As Leader Of Mahagathbandhan? Bhavna Vij-Aurora	February 07, 2019 00:00 IST CBI-Kolkata Police Face-Off: Can Mamata Establish Herself As Leader Of Mahagathbandhan? For Mamata Banerjee, the way to Writer’s Building—office of the West Bengal CM—and now Nab­anna, the temporary seat of gove­rnance, had gone through the corridors of Rail Bhavan. Una­pologetic about using her two stints as railway minister for her state, new trains, railway lines and projects for Bengal went into the making of her highly emotive ‘Ma, Maati, Maanush’ campaign that ended the 34-year Left Front rule. Eight years since, as she takes on the Narendra Modi government to “save the Constitution”, she seems to be looking at catapulting herself to the PMO in Delhi from Esp­lanade in Calcutta—site of her three-day sit-in against CBI “highhandedness” and a “saffron attack” on Bengal. Claiming moral victory, she called off the protest after the Supreme Court forbade the CBI from arresting Calcutta police commissioner Rajeev Kumar and ordered him instead to be available for questioning regarding the chit fund scam. The scam that involved Sharada, Rose Valley and some other players broke in 2013 and the CBI took over the probe in 2014. Coming just months ahead of the general elections, the ­timing of the CBI push against Rajeev Kumar, who had headed the Bengal ­police probe into the scam, has given Mamata enough fodder to raise the cry of political vendetta. But her move also means a breather to her partymen ­already in the dock for the scam that defrauded millions of people. Citing vendetta, those accused too could well play victim now. 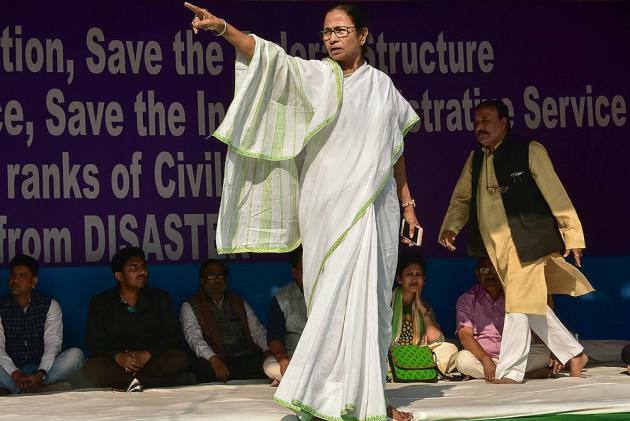 The sit-in may be over, but Mamata’s next stop is New Delhi. Before getting off the stage, she announced the next protest would be in the national capital on Feb­ruary 13 and 14. “We are not stopping the fight. We are taking it to Delhi,” she said, while Andhra Pradesh CM N. Chan­dra­babu Naidu of the Telugu Desam Party stood beside her. Naidu had walked out of the NDA last year, alleging PM Modi had no time for allies. “The BJP wants to block the development of all opposition-ruled states like Bengal, And­hra and Delhi. But together we will fight,” said Naidu from the Calcutta stage. All opposition parties, comprising the emer­ging mahagathbandhan, are exp­ected to join the agitation against the “attack on the federal structure by the undemocratic BJP government”. Several opposition leaders laud Mamata for taking on Modi, but insist she isn’t leader of a grand alliance yet. Except the Telangana Rashtra Samiti, all opposition parties across the country had extended support to Mamata’s sit-in. Several leaders called her up, tweeted and sent messages of solidarity. Naidu, Rashtriya Janata Dal leader Tejashwi Yadav and Dravida Munnetra Kazhagam leader Kanimozhi were among those who reached Calcutta to stand beside Mamata. Earlier, on January 19, the opp­osition had put up a show of strength in the city with the Bengal CM holding fort. So has Mamata managed to position herself as the first among equals in the grand alliance? Outlook spoke to leaders of several opposition parties, who laud her for taking on the Modi government, but insist she is not the mahagathbandhan’s leader yet. The refrain is that it would fin­ally come down to the seats the parties bag in the forthcoming elections. Political analyst Rajat Roy says the turn of events has made Mamata a major contender for the PM’s post. “Though Rahul Gandhi too is taking on Modi on issues like Rafale, the fact that Mamata holds a constitutional position does make a difference. She has established herself ahead of others in the grand alliance, and her experience of governance sets her apart,” adds Roy, revealing Mamata has hinted in her circle of friends that she is in a better position as a seven-time parliamentarian and two-time CM, who has also been a Union minister twice. Roy believes that since all regional ­parties are supporting her, she may be in a position to cobble up a coalition ­without the Congress. “Mamata is ­cultivating all regional leaders like Arvind Kejriwal, Akhilesh Yadav, Naidu and some small parties from the Northeast. Her ultimate aim is definitely the PM’s post,” he says. A Congress leader concurs that Didi is trying to show she is the only one who can challenge Modi and BJP chief Amit Shah, but that doesn’t make her the leader. “Rahul Gandhi has worked harder, chipping away at Modi’s image, also by raising the Rafale issue,” says the leader. “If the Congress gets 120-140 seats, who can deny the party a leadership role?” Bengal, with 42 seats, may be an important slice of the pie, but not big enough to push Mamata to the front of the line. Rahul had tweeted his support for Didi, saying, “We stand shoulder-to- shoulder with her. The happenings in Bengal are a part of the unrelenting att­ack on India’s institutions by Prime Minister Narendra Modi and the BJP. The entire opposition will stand toge­ther and def­eat these fascist forces.” Congress spokesperson Pawan Khera says support for Mamata was for the issue she raised. “The CBI is not following procedure. It cannot function in a ham-handed manner. It cannot decide not to file an appeal in the Justice Loya and Sohrabuddin cases, and go after political rivals of the ruling party,” he tells Outlook. JD(S) general secretary Danish Ali says the grand alliance has no leader and that all the parties are going to fight the BJP collectively. “We will not fall into the BJP-RSS trap and declare the alliance leader before the elections. Our common resolve is to remove Modi’s BJP, which is demolishing the federal structure,” he says. His party leader, former PM H.D. Deve Gowda, was among the first leaders to extend support to Mamata. The BJP, having emerged as the Trinamool Congress’s main challenger, ahead of both the Congress and the Left, is convinced Mamata is manipulating the entire opposition to accept her as leader—and also that her actual gameplan is to keep the saffron party out of Bengal. She didn’t allow Amit Shah’s rath yatra in the state and has also been stopping choppers from using public grounds during rallies by BJP leaders. In his blog, senior BJP leader and former FM Arun Jaitley called the opp­osition a“Kleptocrat’s Club” and opined that Mamata’s “disproportionate reaction” to the CBI was “to project herself as the nucleus of India’s opposition. Her speeches attack PM Modi, but her strategy is aimed to defocus some of her other colleagues in the opposition and hog the centrestage,” he wrote.